Published moments ago by La Stampa's Andrea Tornielli. We post it here for the record of ongoing events and media reports. The Superior General of the Society of Saint Pius X [SSPX, Bishop Bernard Fellay, took hold of paper and pen to send a reserved message to the other three bishops and to all priests belonging to the Lefebvrist group, confirming the state of relations with the Holy See. Fellay, making reference to the media rumors on a possible positive outcome of the dialogue with Rome, would have explained that, at this moment, nothing of a definitive nature has yet taken place, neither in the direction of a canonical recognition, not in the direction of a rupture, and is thus in a moment of expectation. The bishop, according to the rumors gathered by Vatican Insider, wished to confirm to the priests of the Society that which he had already written a few days ago, recalling the two principles that guide the Lefebvrists in the relations with Rome: the first is that no concessions be asked from the Society that touch upon the faith and that which derives from it (liturgy, sacraments, morals, and discipline). The second, that a true freedom and autonomy of action be granted to the [Society of] Saint Pius X, which would allow it to grow and develop. How to interpret this message of the Lefebvrist superior? Above all, it is interesting to note that the possibility of a positive outcome - which many sources, both those close to the Society of Saint Pius X and those Vatican [sources], consider at this moment probable and imminent - is not denied at all. Fellay, who knows he has within [the Society] a group outspokenly opposed to the agreement (estimated at around 25%, but which includes also the other three bishops, Williamson, Tissier de Mallerais and Galarreta, though with differentiated positions), probably wanted to calm his internal partners on the fact that the canonical setting and the reentry into full communion will take place according to those two conditions already made public by him in the past few weeks. Tornielli should really not go around publishing these things. Private letters are private letters. On this day of the Holy Father's birthday; let us pray more fervently for Him and a for favorable amicable agreement for the SSPX also! It's also not the first time he's been dead wrong. If what he writes is true, we have a problem, mission control. While the Pope will grant the needed freedom (because not a personal prelature), I cannot see how the Pope will not make demands on doctrine, at least on the principles and criteria mentioned in the Preamble. This should be a very historic week in the history of the Church. It looks like 2012 may well be the most notable year in SSPX history since 1988, one way or another. Tornielli should really not go around publishing these things. Tornielli is a known stooge of a certain wing of Vatican bureaucrats (how else do you think he gains access to so much information; remember: the bureaucrats just don't give access away for nothing -- there's always a quid pro quo). Tornielli keeps ratcheting up expectations. I suspect that he does so without authentic foundation, but it serves the purpose of building pressure within the Vatican and keeping the Holy Father and Bishop Fellay on the hot seat. Opus Dei does NOT want an Ordinariate for the SSPX. This would weaken their influence. They're not about to let that happen without attempting to throw a couple hand grenades into the process. What of Opus Dei, Bartholomew? Tornielli is a shameless journalist on the payroll of a leftist newspaper! The way he feeds on gossips and on alleggeds "coups d'escène" is vicious even for a socialist. This article is the proof: if the message is genuine, it doesn't say nothing more than what we already know...it's been for months that Mons. Fellay is saying that if Rome accepts us as we are, we are ready....where's the bomb news then? Once again, journalists are there to create tension, anticipation and sensationalism, not to report facts. This way of doing is disgusting! I am and have been praying very hard for a solution that will truly benefit Christ and His Church. If this agreement does not work out, then I hope that all the prayers from both sides will be sufficient for us to be confident that for some reason the Holy Spirit was not satisfied with the agreement somehow, and perhaps a new, better agreement can be made in the future. Either way +Fellay knows whether what he's put into his "Clarification" will be accepted by Rome or not. He knows whether he's bringing on regularisation or whether he's leading the Society into schism. I hope and pray it is the former. Our Pastor received a request from his district superior to read the communique from the pulpit. Setting aside Mr. Tornielli's speculation, the contents (based on my fallible memory) coincide with the article. "The bombardment will come from all corners (ie from the leftists, the liberals, the freemasons, the talmudists and the neocons, especially through the media.)" The "bombardment" will also come from Catholic Traditionalists, particularly within the SSPX. As you stated, "Well, It looks as if Bishop Fellay is trying to keep a rebellion from happening within the society when this agreement is signed"
These events will live in memory, or in infamy. I believe that the number of opposed is greatly above 25%, but even if we take this number to be true, the question then arises why would Mons. Fellay risk a considerable split in the Society (cca 150 priests is no small number) just to make an agreement with the Vatican which is still overrun with modernism and lightyears away from returning to Tradition? Does His Excellency have his priorities straight? Would the Venerable Archbishop even consider splitting the Society in two for the sake of an agreement with the Vatican? It's funny (sad) that history could once again be repeating. I hope and pray that it doesn't. Yet We could be witnessing something very similiar (not the same, but similiar) to what happened when the FSSP broke away from the SSPX to come into "full communion" with Rome. The SSPX, could again be splintering. Yes, but not only will it come from traditionalists as I stated, but mostly from the groups and people who I mentioned above because they control more of the media, etc. inside and outside of the Church. You say "I cannot see how the Pope will not make demands on doctrine". 1) The Holy See adopts an "hypertrophied" conception of "obsequium religiosum" and request the SSPX to give assent to CVII. Some exceprts in mons. Ocariz Braña's text about this were at least problematic on this regard. What would be the solution? Clarifying the concept of "obsequium religiosum". As far as Donum Veritatis go, respectful dissent from non-definitive teaching is possible. 2) The SSPX assumes that (a) the doctrines they uphold are "de fide" AND that (b) there is a strict logical contradiction between them and post-conciliar magisterium. If the SSPX is absolutely convinced about (a) and (b), then a solution which contemplates "dissent" is not possible. As the solution to the feeneyite affair demonstrates, "dissent" is possible even with "fidei proximae" doctrines, but not with "de fide" teachings. So, to answer your question: How could the Pope not make demands on doctrine? -The SSPX to uphold their positions as "traditional doctrine" but not as "de fide" definitions; OR regard the CVII and post-conciliar magisterium as "problematic"/"confusing"/etc., but not in strict logical contradiction with previous definitive/infallible pronouncements. -The Pope to adopt a definition of "obsequium religiosum" flexible enough to allow systematic (but respectful) dissent from CVII teaching. There is one more thing: the status of Vatican II as a magisterial act. Those theories that regard the Council as an invalid magisterial act or as having the same authority as a homily will never be accepted by this Pope. So, if the SSPX insists with this, there will be no agreement under this papacy. I don't know how many within the society think like this... to my knowledge, mons. Lefebvre's opinion regarding the Council as a whole was not so negative. Tornielli is indeed, as Bartholomew indicates, feeding the public the information he gets access to, the selection itself being a way to steer reactions and the perception of events. However, Tornielli must also, as all "vaticanists", show himself to be well informed and correct in order to be listened to and valuable to his informers. As he is not a friend of traditionalists, in my opinion, the only reason for him to switch to a sweet and moderate tone on the possibility of a re-union is that there is in fact something in the offing ... else, he would have already lashed out at those heretic schismatic trads. The silence of humble adoration will protect our "Fiat" freeing us to implore the salvific same for the souls of Our Holy Father and H. E. Bishop Fellay who must appear before the Divine Judge answerable for their privileged position of service and the performance of their duty of state. "Tornielli is a shameless journalist on the payroll of a leftist newspaper! The way he feeds on gossips and on alleggeds "coups d'escène" is vicious even for a socialist. "Once again, journalists are there to create tension, anticipation and sensationalism, not to report facts. This way of doing is disgusting!" Le Figaro - "Rome and Écône on the verge of reaching an agreement" "
Catholic Traditionalists do the same as Mr. Tornielli. That is, they traffic frequently in spectulative "news" reports. Posters then create scenarios, "tension, anticipation and sensationalism." Traditionalists can heed Bishop Fellay's rational approach...pay attention only to official statements from Rome and the Society. Or we can read Catholic blogs that feature endless reports of BRREAKING NEWS...ROME-SSPX AGREEMENT IMMINENT. For most of us, the irrational approach is, well, fun. You state: "These events will live in memory, or in infamy. I believe that the number of opposed is greatly above 25%, but even if we take this number to be true, the question then arises why would Mons. Fellay risk a considerable split in the Society (cca 150 priests is no small number) just to make an agreement with the Vatican which is still overrun with modernism and lightyears away from returning to Tradition?" I think the first reality is that regularization is normal. I'm a "society guy" if you can call anyone that, and it seems abundantly clear that if Rome asks you to sign a document that you can, in fact sign (assuming that's the case), then you sign it. It's not an option of negotiating. Even Bp. de Galareta made that point last year; we discuss with the Vatican, we don't negotiate with it, because Catholics don't "negotiate" with the the highest authority. The second thought that comes to mind is that Tornielli says 25% are opposed; this doesn't mean 25% will leave, or that any of the three bishops will. You're comment that he's risking a split is just a bit too much saber rattling. "Does His Excellency have his priorities straight? Would the Venerable Archbishop even consider splitting the Society in two for the sake of an agreement with the Vatican?" So, last things first: probably not a great idea to capitalize the V in venerable. The Society has made sure to prevent anyone from seeming to give public veneration of the Archbishop, since, it can in fact hinder a cause for canonization in the long run. The second thing; what has mean old Bishop Fellay (the crypto-modernist, no doubt) done against Catholic Tradition, the faithful under his care, his priests, etc. that gives you cause to doubt? Isn't it a rather grave implication (or even merely a question) to ask if Bishop Fellay has his priorities right? The point, of course, of your comments is to stir up doubt that he has correctly ordered his priorities. Have you been given grace of state to make these decisions? Is there some official role of "armchair commentator for traditional affairs" that I'm unaware of, and that you fill? Otherwise, go troll elsewhere. There is one more thing: the status of Vatican II as a magisterial act. Those theories that regard the Council as an invalid magisterial act or as having the same authority as a homily will never be accepted by this Pope. So, if the SSPX insists with this, there will be no agreement under this papacy. I don't know how many within the society think like this... to my knowledge, mons. Lefebvre's opinion regarding the Council as a whole was not so negative." I think this analysis is correct and is the only possible solution. It will also, you will note, bring significant balance back to the Church on these questions, as the Libs will no longer be able to claim that their understanding of "religious liberty" is some sort of binding dogma on Catholics, but that the traditional understanding must also be allowed (even if disagreement on this point is possible). Will we have to wait until after this coming Sunday for the Vatican to respond? I am a "society guy" too. On Sunday our pastor instructed the flock on the current situation and chastised those that listen to gossip, the unofficial garbage the secular media puts out and musings on religious blogs. He said prayer and sacrifice is needed - to keep praying for Gods will to be done, that Bishop Fellay has abundant grace from the Holy Ghost and for the Pope. He said that Catholics that do not love the Pope and the papacy are not Catholics at all. Rest assured Bishop Fellay will not risk killing the Society for a poor agreement. I think the society is more unified then ever. These emotional responses won't come to much. Bishop Fellay ultimately decides - he is their chosen leader by the grace of God and they will obey. SSPX/ Rome Negotiations will be discussed tonight on Colleen Hammond's new radio show. Guests include theologian Dr John R.T. Lamont from Australia and John Vennari, editor of Catholic Family News! The Tornellians need a spin to maintain a perception among Vaticanologists of their usefulness. As such, no need to lambast the fella, useless as he may really be. Bp Fellay is not publishing this to his fellow SSPX Bps as some here allude. He would have discussed any potential move with them months in advance. There is nothing different in this approach than what a corporate executive does to prepare the inner workings of his organization for an impending re-org or a seismic shift in corporate vision. It is usually well after the real decisions have actually been made and agreed to. If Torniellians are correct, I would suggest that Bp Fellay has fed the news of this "letter" to the media HIMSELF as a preparation for the big news to come. Again, gauging by the Holy Father's sense of Theological symbolism in the number 7, I expect his 7th anniversary on the Petrine Chair, April 19, to be the date this momentous agreement becomes formal and public. This fits with the report last Friday that an agreement is "within days not weeks". This will be a Papal statement that He views this as the completion of the primary objective of his papacy. And in my view, this will truly establish Benedict XVI as "The Glory of the Olive", although I have no disillusions as to the enormity that lies ahead for a united Rome-SSPX army in the effort to devastatingly crush the forces of modernism in our time. As God rested on the 7th day, maybe now the Holy Father will also see a sense of "spiritual rest" for himself as the sun sets on his life - I am sure his 85th birthday will re-enforce that sense of mortality, though I pray he will have many many many more years of mental and physical health to continue to steer the Church through the rocky waters. The TOrnellians sense this and realize they need to start sounding off a tad more congenial towards the "Lefebvrites" (sic) or "Lefebvrians" (sic) now that Pope Benedict XVI is soon to have actually drawn a line in the sand for non-trads in this regard. In fact, in this regard, I have to say that this sounds like the most congenial Tornellian spin on the SSPX ever. Any naysayers on this point? I am a Society man as well, to the core. I was not discussing opinions but facts. It is a fact that there are many in the Society opposed to any deal with present Rome, including the three bishops. It is a fact that Bishop Fellay has, despite of this, proceeded to say that he wants a deal and that it is possible. It is a fact (or at least very likely) that such a deal would cause a painful split in the Society, the extent of which only Our Lord knows. Does His Excellency, Mons. Fellay seem worried by this certain outcome? Surely he would not sign a deal if the outcome is thus? Or would he? How is it a greater priority to make a deal with a hierarchy which is imbued by modernism and which would bring great danger to the survival of the Society, than to keep the Society intact and secure? In 2009 Mons. de Galarreta, the main "negotiator" with the Vatican, said that making a deal without Rome returning to Tradition "would be the death of the Society"
I suggest you also check out the quotes of Mons. Lefebvre on the main site of the UK SSPX, to get his opinion on the matter. Unless you work with the other three bishops personally, then you don't know, and cannot say, that they oppose any reunification with Rome. You have opinions, as we all do. But unless you're going to show some evidence, beyond "I know a guy who knows a guy ..." then you really can't say the other three totally oppose a deal. Truthfully, I don't think anyone can even say that about Williamson. The reason for the secrecy is so that no one gets made a fool of. The Vatican knew before last week what the SSPX would say. The SSPX knew before responding what the Vatican response would be. Otherwise, we wouldn't have heard anything about it. It's a done deal. Has anyone else noticed that Bishop Williamson did not send out his weekly email this past weekend? Ecclesia Militans writes: ...why would Mons. Fellay risk a considerable split in the Society (cca 150 priests is no small number) just to make an agreement with the Vatican which is still overrun with modernism and lightyears away from returning to Tradition? This is precisely the attitude within the Society that I find so depressing. Apparently, Rome must perfect herself before some in the Society will deign to treat with her. No matter, apparently, that this pontiff has met all of the Society's announced preconditions. But there is another possibility: That Rome will fully return to Catholic Tradition, and that the SSPX can help make that happen by being fully reconciled canonically. I can see both sides of the coin, I can also say from PERSONAL experience with bishop williamson i.e having heard his sermons in person, that if the deal is at all dodgy there could be issues, the same goes I would say for some of the UK district. And I think it is also fair to say that he is opposed to the deal, again from his sermons. As a whole I, so long as the SSPX is not contaminated as the other groups have been, am in favour of an agreement. There are issues with unacceptable areas of canon law i.e allowing communion to be given to non catholics, the 'psychological immaturity' ground among others for annulment and so on but if it can all be sorted out then an agreement would certainly be of great benefit to both sides. Unless I am mistaken, the SSPX is making a profession of the Catholic faith as it has been made for over 2 thousand years. It is the Vatican that demands that the SSPX accept certain controversial points. Many inside the Church dissent from a great many more points in Vatican II documents but are considered not to be heretics. I trust the Holy Father. He will do the right thing. Somebody who systematically uses the word 'Lefebverists' to describe the members of the FSSPX is not objective, but subjective in his (or her) commentary. "why would Mons. Fellay risk a considerable split in the Society...?" Why? Luke 14:26 "If any man come to me, and hate not his father, and mother, and wife, and children, and brethren, and sisters, yea and his own life also, he cannot be my disciple." Ultimately, for the SSPX is not to be sedevacantist, reunion with Rome must happen.The only question should be the terms. Few people would disagree that the Church is a mess at the moment, but it's not the first time nor will it be the last time. If there are sedevacantists within the SSPX, they'll be forced to make a choice. That's the beauty of clear doctrine, it forces people off the fence. It's the reason the TAC split after Anglicanorum Coetibus was announced even though the stated mission of the TAC was reunion with Rome. So the SSPX will likely desire terms that would prevent it from being consumed by that mess, but at the same time allowing it to help clean up the mess in the greater Church. The Pope desires this too, but has to be concerned that if the SSPX is given too much leeway to pick and choose what it will or will not believe in Vatican II and what it will and will not submit to in Rome, that it will ironically validate Cafeteria Catholicism. This is something neither the Pope nor the SSPX desire. Both +Fellay and the Pope want this to happen, badly. Think of the millions of rosaries said for the lifting of the Excommunications. The facts is this Pope himself said that Vatican II proclaimed "no dogmas at all" (or new dogmas, I guess you could say). If the Pope offers a fair and sustainable ordinariat, I think SSPX should run with it. Recalcitrance can only be justified for so long. Even St. Athanasius came in from the cold. Having said that, and not being behind the doors, even if there is not immediate rapprochement, I will still attend Society chapels. They have already been a tremendous force for good in the Church. -What prospects do you see for the Fraternity of Saint Pius X in the future? An agreement with Rome? A canonical recognition? -[Galarreta:] No, absolutely not, whether in the immediate or in the mediate future. We specifically exclude this possibility. We know that while there is no return to Tradition on the part of Rome, any practical or canonical agreement is incompatible with the public confession and defense of the faith, and would mean our death. In the best of cases, humanly speaking, we will have several years of discussions. Mons. Williamson's views are known from his Eleison comments, which are available online - he is clearly opposed to any kind of deal at the moment. While being a staunch traditionalist, I do feel somewhat sorrowful for Pope Benedict XVI right now. I have to think that at some level, he sees, he senses, the Second Vatican Council project starting to ever so subtly fade off into the distance. From a doctrinal, liturgical, and eccleisal viewpoint, I can only cheer, to be honest. And I hope we're on the brink of an SSPX regularization that's going to be a key catalyst in shaking the neo-modernist edifice down to its foundations. But our pope, for all the areas where I must disagree with him, is by all accounts and appearances a pious man and one who truly wishes nothing but the best for Christ's Church. He must at some level be witnessing his life-long project slipping away. And he has made commendable, tough decisions to forge outreach with traditionalists, however much he must disagree with us in varying ways, when he could have come down like a ton of bricks and given us a reprise of the worst elements of Paul VI's and John Paul II's pontificates. This doesn't excuse, and isn't to make light of what has happened, and what the Church in general, and traditionalists in particular, have been put through. But I feel sorry for our pope, who, however non-traditonal he is in certain respects, is still our pope and a man of God. My God bless him and have mercy on him. 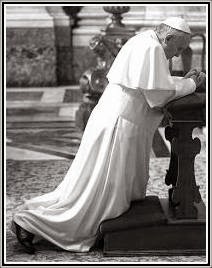 Let us remember our Supreme Pontiff in these prayerful hours at what we hope and trust is another red/yellow streak of sunrise about to appear on the horizon of our ongoing, hopeful traditionalist dawn. I agree with Adfero on this point. Particularly in the context of +de Mallerais. That statement (which he also gave at the local SSPX church an I recorded on DVD) is focused on the preamble as it existed at that time. Ultimately, the same can be said for the other SSPX Bishops. You won't 'know as fact' whether or not they will agree with an agreement that is made by +Fellay until the -FINAL- agreement is made. That fact will then result in a cascade of decisions and fault-lines becoming clear. "You will be surprised by who stays and by who goes." Perhaps The Holy Father will give us a party bag filled with The complete Restoration of Holy Mother Church. If not, may The Immaculata come soon. The Society is nothing like the modern Vatican and they do not speak politically, or at least did not until some started recently. To speak in contradiction, ambiguously, politically is a characteristic of the devils, which is what Our Lord warns when He says "Say only yes yes, or no, no." So I believe those words of Mons. de Galarreta, Mons. Williamson and Mons. de Mallerais. As for the part about trust, first of all, having read Mons. Lefebvre's words I know that this is against his express wishes. As for trusting the Pope, I have had absolutely no trust in any of the conciliar popes, and no reason to change this position, confirmed many times over. As for being sure that God's Will will be done, I have seen how men many times obstruct the completion of God's Will, which He permits because of free will, as a punishment to faithless mankind, and to purify His Church. Or do you think it was God's will for the New Mass to be promulgated, or for ecumenism to be enforced? In the end, men will scourge the Church so much that no human solution will be possible - then God will intervene and show His boundless love for His Immaculate Spouse, humiliate her enemies, give strength to her children and glorify His Holy Name. First of all, we've all seen those interviews. Take it from someone who played politics in DC for over 10 years -- these statements are so hyperbolic they can't be seen as anything but purely political. And they leave so many holes you could drive a truck through them. Remember, no one plays politics better, or has done so longer, than the Church, and the Society is no exception. Second, people in power, even bishops, make statements to rally the base. That doesn't mean they'll never go back on them, or explain them "more fully" one day, so you can see what they actually meant when they said them. When this is all over, and all FOUR bishops have been welcomed back and accepted, as I bet they will, let's talk again. You either need to trust in the Holy Father or trust that God's Will will be done. You can't just not trust and go on in a state of independence forever. That's Protestant and, frankly, material sedevacantism. I pray, based on Bishop Fellays response to the preamble, that our Holy Father declares that the SSPX is fully Catholic with licit and valid sacraments. At this time, any formal agreements or structures beyond that may precipitate more problems than solutions. Why does sedevacantism always have to be portrayed as the ultimate sin? the root of all evil? Sedevacantists did not ask for this crisis – it is simply a way for sincere and loyal Catholics to explain the current crisis. No trad who views the pontificates of the V-II popes as legitimate has the authority to decide for himself, to sift the pronouncements of a lwaful magisterium as is done all the time. It's like the pot calling the kettle black. Melchior Cano thank you for reminding us of this: " It's not an option of negotiating. Even Bp. de Galareta made that point last year; we discuss with the Vatican, we don't negotiate with it, because Catholics don't "negotiate" with the the highest authority." Many people forget how things really are when the Holy See asks to do something. Now, we are going through a very important time in the history of the Church, that is why our anxiety, but we must continue our vigil. We all need to know exactly what is the status of the SSPX in the Church, that much I know. May God's Holy Will be done!!! "So I believe those words of Mons. de Galarreta, Mons. Williamson and Mons. de Mallerais." Aside from +Williamson, have +de Galarreta and +de Mallerais contacted you personally to provide their opinion on the current (emphasis important) contents of the preamble? They were not commenting on the preamble as it exists now. In other words - that was then, this is now. In the meeting last September the superiors met and (I assume since I wasn't in the room) set out principles for an 'agreement'. Much as they did in determining the pre-requisites for Rome to provide proof that they are worthy of trust. These conditions are now fulfilled. Now if an agreement provided by Rome meets the new 'conditions' as noted, then the SSPX (including 'us') get to move on the next phase. I agree with you. I have long advocated that the Pope should, sua sponte, just lift the ad divinus suspensions of the priests of the FSSPX. Certainly that would be as easy as, or easier than, lifting the excommunicationgs. But, again, the Pope might be posturing--in good intention--for a more formal and regular situation. Who knows. It is conjecture to postulate in our arm-chairs further. The Pope is a dichotomy: he has great esteem for FSSPX and for Vatican II. But one could argue that that Council, though valid, has wrought nothing of value, whereas FSSPX has, through their "disobedience", been the greatest boon for the Church since Trent. "Saint" (maybe) Lefebvre, ora pro nobis; excommunicated Saint Athanasius, ora pro nobis! "Benedict began the day with a Mass in which he alluded to his own mortality, saying he would carry on his final years knowing that God was watching over him. To those who believe that just because we have a crisis in the Church such as liberalism,etc, it is ok to abandon the Church, and therefore we need to look for Church somewhere else, well I say to you,true Catholics work and fight for Tradition INSIDE THE CHURCH with prayer for guidance and humility so we do not fall to our prideful selves, and so I totally agree with the Holy Father,Catholics believe: in spite of the darkness GOD is there. GOD'S LIGHT WILL ALWAYS BE THERE AND HE IS STILL, IN CONTROL OF HIS CHURCH. This is all about men and not God. Which one? "Material"? Or "sedevacantism"? 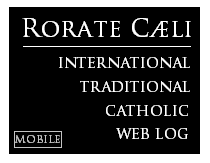 The following may be of interest to Rorate Caeli. "The SSPXers have been doing their own thing for a long time now. Some of them have never known unity with the See of Peter." Their bishops aside, did Rome excommunicate SSPX priests? Did the excommunications include laymen who had attached themselves to SSPX chapels? But that's exactly what the sedevacantists do. They sift the statements of post-conciliar Popes, judge for themselves that they don't match the statements of preconciliar Popes, and then judge that the Pope has lost his office. So they do everything they accuse the SSPX, etc., of doing, with the added bonus of rejecting the Pope. Tim, the priests and the faithful were not excommunicated. Tim, the priests and the faithful were not excommunicated." Thanks. It is strange that the popular priest/blogger, who positions himself as a traditionalist/conservative, would present many "SSPXers" as having never enjoyed unity with the See of Peter. If the Society as a whole wasn't excommunicated, then why would a knowledgeable priest have presented "many SSPXers" as having never known unity with the Pope? I guess that is what the SSPX is up against. Even traditional/conservative priests misunderstand the SSPX's history. I believe there was a case where a local diocesan Bishop declared excommunicated all the faithful who attended SSPX masses in his diocese. This was appealed to the Holy See and then-Cardinal Ratzinger allowed the appeal, declared the excommunications retroactively invalid (i.e. never valid) and published the decision as a prot. Perhaps others will have the details. Bottom Line: During this period of half in/half out (i.e. de facto in, de jure out) no one in the SSPX is excommunicated. After each side finally "fishes or cuts bait" in the next few days, we will enter a period of totally in, or totally out. In the latter case, I suspect that explicit excommunications would follow. The irony is palpable: An excommunication is a legal device by which persons are placed outside of salvation, and therefore if they die unrepentent they go straight to hell. The liberal concilar church, however, believes in salvation outside the church and rarely believes in hell (or, if hell exists, that no one goes there anymore). In other words, the liberals would impose a penalty that they no longer believe in! First of all, from some of the qq. here, it can be seen that some are new to this. No, the priests of the S.S.P.X were not and are not excommunicated. Forget all this. This morning, there were no appointments yet again. There has not been even one since Spy Wednesday (4th April) and few before then. The number of vacant sees has soared to over 150, something never seen before. The Pope's words were slurred and he was confused at times in Mexico & Cuba. Yesterday, he spoke of the final leg of his journey. I suggest that we drop all other concerns and pray for his health. If this matter with the S.S.P.X is not settled *very* soon, it might be too late. Now, I'm no prophet but, when you see clear signs, you need to start to worry. He did not arrive from Castel Gandolfo to the Vatican until last Friday evening. We had better pray to God that something is published THIS WEEK. For those interested by the thorny question of the degree of assent required by Vatican II documents, Fr Bernard Lucien (Vaduz) is providing a clear cut version of his erudite and accurate thoughts in the last issue of "Sedes Sapientiae", the FSVF review (in French) n°119. "L'autorité magistérielle de Vatican II. Contribution à un débat actuel". He is discarding the global devaluation of Vatican II as "pastoral" because of the ordinary Magisterium. His appreciation is between the excess of "obsequium religiosum" - as explained by P.K.T.P. - and the other excess of throwing a legitimate ecumenical council in the trash bin. He is considering 3 degrees which are all present but especially the last one, he calls a "pedagogical non authoritative magisterium" where some mistakes or weaknesses could be found. It would be great if Fr Lucien had this study translated in English and other languages. The Jesuits just sold St Cuthberts Gospel for something like 9 million pounds to the British National Museum. Yay, more dough to the Jesuits! Both, in the context its one word. "Rom, 17.4.12 (Kipa) Im Vatikan ist nach Angaben seines Sprechers Federico Lombardi noch keine Antwort der Piusbrüder mit einer Reaktion auf die lehrmässige Präambel vom 14. September 2011 eingetroffen. Zumindest bis Montagabend sei kein derartiges Schreiben angekommen, sagte er am Dienstag gegenüber der Presseagentur Kipa. Gegenüber Radio Vatikan teilte er anschliessend mit, er rechne jedoch mit einer Antwort in den nächsten Tagen." So according to this sources Lombardi said that there is still no answer of the SSPX! I wonder if Tornielli would be happier writing for The National Inquirer or some other such rag. Seems he likes reporting in that vein but tries to give it some sense of respectability. It's becoming offensive with this continued use of "Lefebvrists," etc., which is actually perjorative. Let's see if he'll refer to Opus Dei as the Escrivists. He ran into a credibility issue some time last year or so and many defended him, but as he continues to write the way he does, one can't help but think there was some truth to the issue. http://justtrusting.blogspot.com/2012/04/what-i-want-to-say-about-case-of.html my blog and my thoughts about the regularisation of SSPX. I am reading Mons. Gherardini's book and these are my thoughts. Per chi fosse interessato dalla spinosa questione del grado di assenso richiesto dal Concilio Vaticano II documenti, P. Bernard Lucien (Vaduz) fornisce una versione chiara taglio dei suoi pensieri eruditi e preciso nell'ultimo numero della "Sedes Sapientiae", la rassegna FSVF ( in francese) n ° 119. Se gentilmente mi date il link, potrei intanto tradurlo in italiano e renderlo pubblico.